I was recently browsing around in the "Books" section on Etsy, and found a book by a fellow BEST member, Meowstro. I was intrigued by something I saw in the description and pictures... the book had hand-sewn headbands. The only headbands I'd ever seen were the kind that you glued on... what I use on my own books. I'd never even realized that they could be sewn on yourself! So I looked around a bit online, and discovered that headbands were originally sewn on to support the spine and protect the pages from damage, and were an integral part of the book. Nowadays, bookbinders tend to use glue on headbands, which serve a more decorative purpose. But even these can be done in different ways, such as sewing them separate from the book, rolling your headbands, or simply purchasing them ready-made! You may find a more thorough definition of headbands here. For a quick tutorial of how to sew headbands directly onto your book, check out Laura's bookbinding blog! Want to sew your headbands separate from the book? Take a look at this TJBookarts tutorial, along with some informational links at the end! To see how you can roll your headbands, check out this other TJBookarts tutorial. Prefer to purchase some ready-made headbands? You can get them at a variety of B&M shops, as well as online at places like Talas. Or if you'd like to make your own headbands and need some supplies, here is a link for twisted silk thread to start you off, as well as a Headbands Manual! Three cheers for hand stitched headbands. The book listed is a good one. Get the hardcover version if you can find it. Oh, I almost bought that book with some of my Christmas money, but ended up with a couple of different books instead (and some paper and binders board, heheh). Great little post, Maiko--thanks! I will have to try out the headbands shown in the link - they look great. 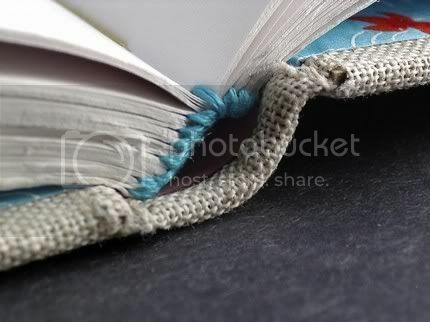 I just sort of figured out how to do mine myself using a blanket stitch, with the knot on top of the book. Sometimes I do the blanket stitch over top of another piece of thread, and then i put the knots at the back of the book...kind of hard to explain in words, but look up "Blanket stitch" and you'll see what I mean! I did the same thing! I saw hand stitched headbands on someone's Etsy shop and dug around the web. I found a great book called "Headbands: How to Work Them" by Jane Greenfield, Jenny Hille.